Iqaluit International Airport in Nunavut, Canada. Courtesy Stantec. With winter temperatures averaging a frosty –30 degrees Fahrenheit, the Arctic is one of the coldest places on Earth. A coming blizzard of economic activity, however, suggests that one day soon it also will be one of the hottest—that is, in terms of demand for architectural expansion. “It is the frontier, but it is becoming more known and getting more attention,” says Arctic native Josh Armstrong, lead architect in the Iqaluit, Nunavut, Canada office of Stantec. It’s plain to see why: The US Geological Survey estimates that the Arctic is home to approximately 13 percent of the world’s undiscovered oil and 30 percent of its undiscovered natural gas. The region is equally rich in mineral deposits and biological resources. According to the Russian Geographical Society, one-fifth of the world’s fresh water and several of its largest rivers are found in the Arctic, supporting hundreds of endemic plant and animal species, millions of migratory birds, and a bounty of fish that sustain commercial fisheries. Companies anxious to find and tap into the region’s offerings will invest more than $100 billion in the Arctic by 2022, predicts Lloyd’s of London. There’s just one problem: Countering an abundance of assets is a shortage of roads, ports, power, and housing—the underpinnings needed to extract the region’s rich resources. 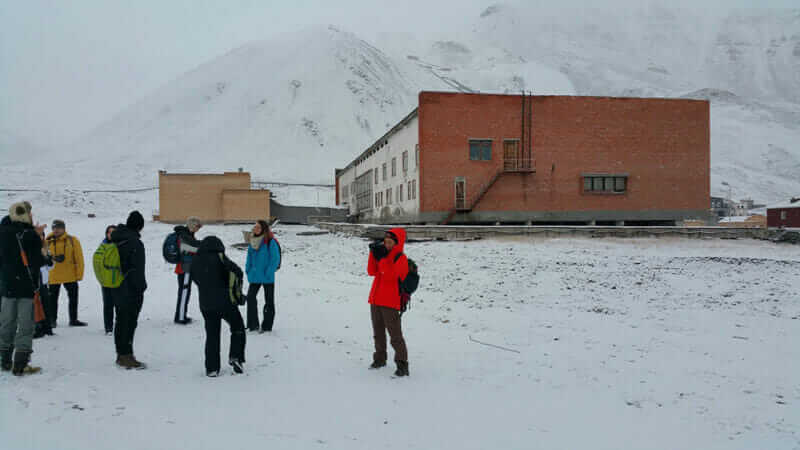 In 2015, 14 students from the University of Virginia School of Architecture traveled to the remote Norwegian arctic islands of Svalbard to research the potential of architecture, urban design, and landscape architecture in an extreme environment. 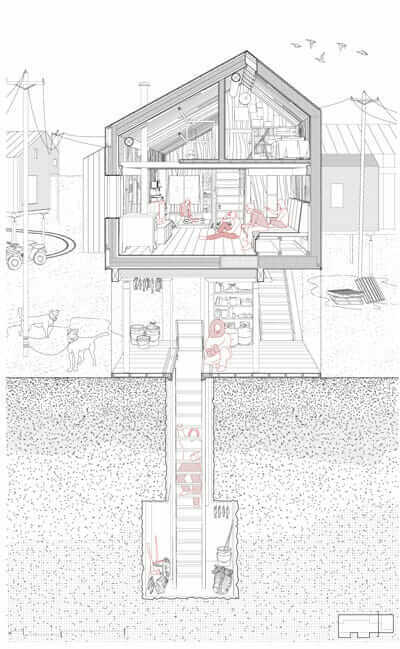 Courtesy Arctic Design Group, School of Architecture, University of Virginia. 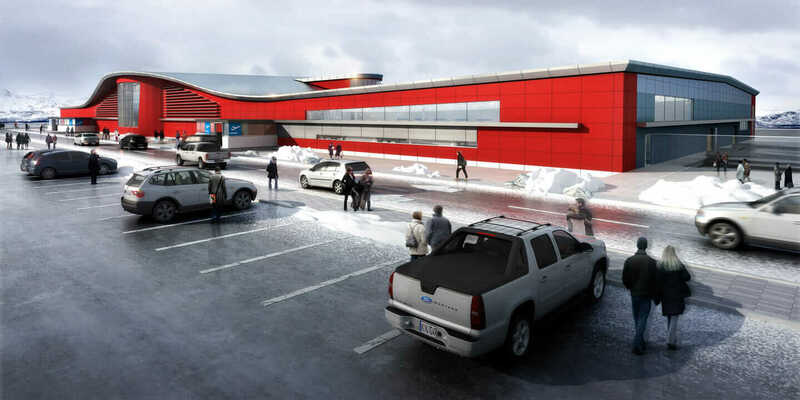 The design of Iqaluit’s new AirportTerminal Building (ATB) perfectly illustrates how architects can activate the region’s opportunities by forging relationships between natural and built environments. Conceived by Stantec and completed in June, the 10,000-square-meter facility was designed to complement the harsh winter climate in Nunavut, which spans the eastern half of Canada’s Arctic. Two common problems are strong winds and drifting snow. To mitigate them, Stantec devised a curved roof that deflects wind and prevents snow accumulation. 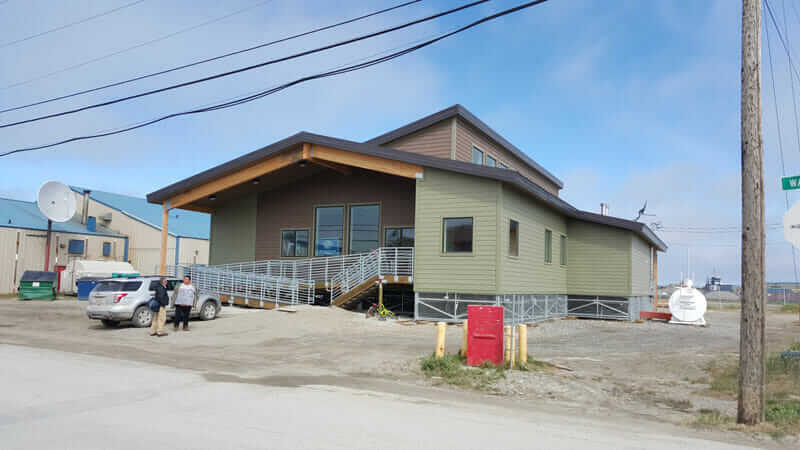 Kotzebue Youth Center in Kotzebue, Alaska, completed in 2015. The center houses the local YMCA and after-school activities for children and teens, and it was designed for -50 degree winter weather over permafrost. Courtesy WHPacific. Daylighting and energy efficiency are also important goals—the former because Arctic winters are notoriously dark, the latter because energy costs there are notoriously high. Unfortunately, windows allow heat loss. Stantec therefore used daylight modeling software to optimize window placement for harvesting maximum daylight from minimum glazing. Finally, there’s the issue of permafrost: Because bedrock is too deep, the foundations of most Arctic buildings rest on piles, or stilts, atop a layer of permanently frozen soil. “Raising the building ensures the wind can blow underneath it, creating a buffer of cool air that prevents the heat of the building from melting the permafrost below, which would cause the building to settle,” Best says. Because it’s the size of a football field, the ATB is too large for stilting. Stantec designed it to rest directly on the ground, mitigated by a system of passively circulating thermosiphons installed beneath the floor slab to keep the soil under the building cold. One of the most expensive things to import is oil. “Because of the high cost of fuel oil, there’s a push to create more clean-energy systems in the Arctic,” explains Anchorage, Alaska–based engineer Daniel Nichols, director of facilities at WHPacific, the United States’ largest Native-owned engineering firm. He says Arctic designs increasingly incorporate biomass heating systems—high-efficiency wood stoves and wood boilers—as well as micropower stations that harness solar and wind energy. Section of a new research facility for UNIS (University Center in Svalbard) in Longyearbyen, Norway. The design called for a series of nested, insulating envelopes to allow for expansion and contraction of the building thermal comfort zone based on season, number of occupants, and usage. Courtesy Dixi Wu, Arctic Design Group, School of Architecture, University of Virginia, Fall 2015 Studio. Arctic architects also must be mindful of building maintenance and operations. “You have to look for ways to make building systems more durable and easier to operate because there aren’t a lot of skilled operators and technicians available who can work on things,” Nichols says. One strategy for coping with these challenges is prefabrication. Iqaluit’s ATB, for example, features a combined heat and power plant that burns oil to create electricity, then uses the byproduct for heat; that system was built and tested at a factory in the south, then shipped north for installation. A prototype house for Shishmaref, Alaska that regulates program sequence from cool to warm, air filters from fresh to stale, humidity channeled from dry to wet, and light becomes accessible even in winter months. Courtesy Ziqi Chen, Ben DiNapoli, Austin Edwards, Tyler Mauri, Arctic Design Group, School of Architecture, University of Virginia, Fall 2016 Studio. Again, Iqaluit’s ATB is a prime illustration. “Buildings in the Arctic are multi-use buildings,” says Best, whose team designed the airport to be not only a transportation center, but also a public gathering place. To that end, the arrivals area is a large rotunda that alludes to the Inuit igloo. Featuring ample seating, restaurants, and Inuit art installations, it’s “a real crossroads for the community, with a strong architectural presence and a distinctive cultural character,” he says. Another local project—the Stantec-designed Iqaluit Aquatic Centre—is similarly dual-purpose, combining recreational facilities with open community spaces, giving locals a shared context in which to gather. Clearly, the Arctic has much to gain from architecture. But architecture also has much to gain from the Arctic.